When i was a kid, part of spring cleaning was taking down every curtain, sheer, and blind in the house and washing them. Nowadays most experts agree that you shouldn't take widow treatments down at all. Just clean there where they are. Curtains and drapes mostly get dusty. Very dusty. The best way to keep your soft window treatments like curtains looking good is to vacuum them thoroughly , top to bottom, at least twice a year. Another option is to take down the treatments and send them for a 10-minute spin in the dryer on the fluff cycle. Then, of course, you have to hang them up again (ugh). Are the drapes a little soiled? Call in one of your local cleaning services. Most drapes must be professionally cleaned. Some cleaning services use a solvent/extraction method directly on the drapes as they hang in the windows. That way you don't have naked windows while you're waiting for them to return. Heavily soiled drapes, however, will probably need to be taken down and sent out. Sheers are some of the most difficult window treatments to clean because they are very fragile and stretch easily. For best results, dust them weekly with a feather duster. If you use a vacuum, use low suction to keep from stretching or puckering the material. Clean only one small area at a time in short, horizontal strokes. Consider using a drapery cleaning service to clean sheers. Look for one with portable injection/extraction machines that clean the sheers without solvents as they hang. Dust shades regularly. If you use a vacuum, be careful not to apply too much pressure. Or, you can blow off dust with a blow-dryer set on low. Spot-clean shades with a sponge dipped in mild hand dishwashing detergent. Gently blot dry with a clean, lint-free rag. 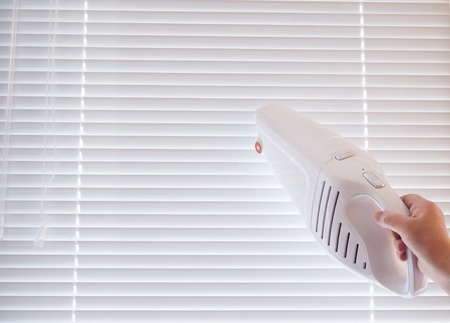 Dust, vacuum, or blow-dry window blinds regularly. To clean wooden painted louvers, tilt them almost all the way up and wipe them with a cloth moistened in a mild detergent solution; then tilt them almost all the way down and wipe again. This ensures that you clean the middle, too. Vacuum or dust blinds regularly to remove dust. Don't wet stained wood shutters because this may damage the finish. Instead, clean them with lemon oil or a wood preservative. Probably the most efficient way to wash vinyl or metal miniblinds is ye olde traditional method of taking them down and immersing them in a bathtub full of soapy water. Rinse them, and then the hang blinds over the shower rod to dry. Don't wash or dry-clean fabric vertical blinds. Clean vinyl or aluminum vertical blinds with a damp cloth. Leave a light film of detergent on the vanes to reduce static electricity. Washing curtains and some valances is something you can tackle yourself at home (see tips on washing curtains below), as long as they are washable, and especially if they aren't lined. Before washing, examine them for sun rotting. If they have rotted, don't bother washing them. Just replace them. Treat stains on soft window treatments by first applying a stain pre-treater, and allow it to penetrate the fabric for five to 10 minutes. Launder as usual in warm to hot water with bleach and detergent.If this doesn't completely remove the stains and odors, repeat and wash again. Don't put soft window treatments into the dryer until you're sure the stains and odors are eliminated. To keep cotton and other fabric window coverings from shrinking, allow them to air dry instead of placing them in the dryer. Finally, resolve to keep your window coverings as clean as possible by vacuuming them weekly. That way, you won't have to repeat this time-consuming process again in the near future.